2017 In A Sentence: The Flyers were the hard luck losers in losing four its six games by 12 points combined in finishing just 5-6 overall–just the squads second sub-.500 record in the last 41 years. Biggest Shoes to Fill: CB/KR Christian Searles was the PFL Special Teams Player of the Year in 2017. He ranked seventh in the NCAA Football Championship Subdivision with 825 combined kick return yards in 2017. He was second in the PFL in both kickoff return average (23.8, behind San Diego’s Emilio Martinez) and punt return average (7.8, behind Campbell’s Jaquan Brooks). He also tied for the conference lead in passes broken up (11) in 2017. Searles also led UD in fumbles forced (2), was third in solo tackles (42) and was fifth in total tackles (58). Key Player: Senior RB Tucker Yinger was an All-PFL first team performer last year. He was third in the PFL in rushing (98.9 yards a game) with seven 100-yard games. He is currently sixth in career rushing at Dayton with 2,417 career yards and has a career yards-per-carry average of 5.8. 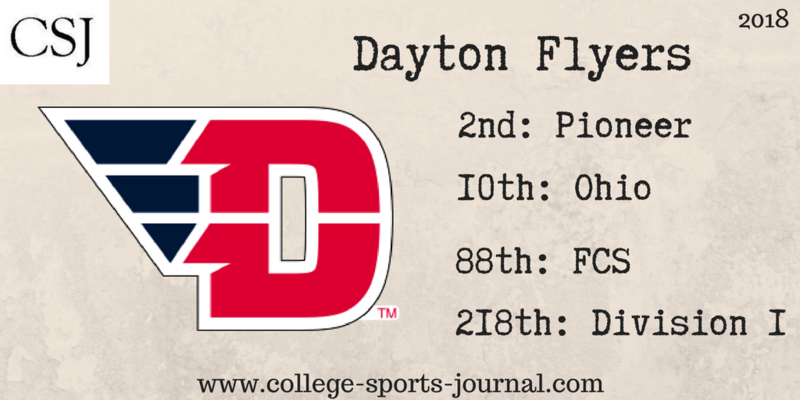 Fearless Prediction: Dayton returns 17 starters – nine from the offense, six from the defensive side of the ball, and both kicking specialists. Among them are eight All-PFL performers so this team, while under-performed in terms of its record in 2017, is poised to make a run at the PFL crown.